I have a Toshiba Canvio 3.0 external HDD. It has USB 3.0. It flashes blue if you connect it to a USB 3.0 port. If it is a 2.0 port, the light becomes white. Yesterday, I plugged it in and the light was blue. Now, I plugged it in the same port and the light is white. Can I somehow detect if the USB port I just plugged in is 2.0 or 3.0? I want to know if there is a problem with the device or the USB port I'm using. There are many more methods here. Check Microsoft's website for info on the different signs you can see. Sometimes, if you plug the USB3.0 device too slowly, it is recognized as 2.0. Why ? Because the 3.0 line of pins is in a second row so if the protocol handshake is finished before your device is fully plugged in, it will never get USB3.0 speed. This is particulary annoying when using USB keys like the Extrem series from sandisk as the plug is on strings and is frequently diving too slowly into the port. I understand that the USB standard indicates that the USB 3 port will have a blue color plastic tab inside the plugin. Just look at ports and plugs and if they are blue then it is USB3. 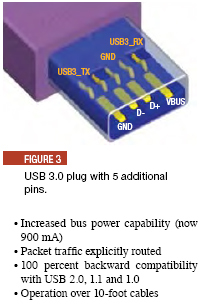 USB 3.0 plugs with 5 pins to get Super Speed. In the "Device Manager" window, click the + (plus sign) next to Universal Serial Bus controllers. You will see a list of the USB ports installed on your computer. If your USB port name contains "Universal Host", your port is version 1.1. If the port name contains both "Universal Host" and "Enhanced Host", your port is version 2.0. This is document aout in the Knowledge Base. Not the answer you're looking for? Browse other questions tagged windows-8 hard-drive usb external-hard-drive or ask your own question.